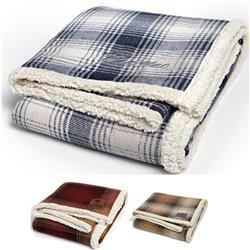 The Cottage Plaid Throw is a stylish accent to any room with this super soft plaid polar fleece reversing to a faux lambswool in vanilla. The high end style of this throw is the perfect item for watching a movie, cuddling on the couch or snuggling up in bed. This makes for a great executive gift or holliday treat. 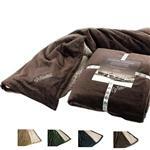 Customize this great blanket with your logo either embroidered or on a patch as shown. 100% Polyester. Plaid, faux lambs wool, custom embroidered or patch blanket.